Google is continuously innovating with Google+ and this is best illustrated through the Google Plus Hangouts with Extras facility. 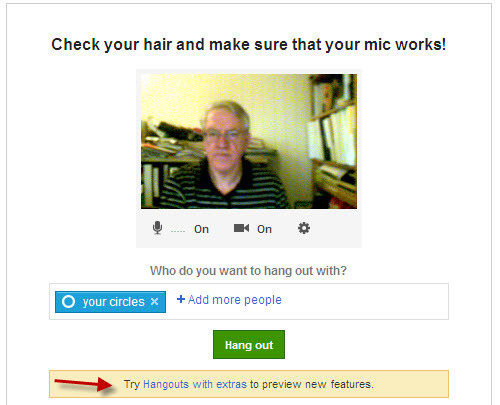 This extension of Google Plus Hangouts increases the opportunities for small business marketing. It also expands the ways that small business owners can use Google Plus Hangouts to communicate with their staff. What is the difference between Hangouts and Hangouts with Extras? You can see from this comparison that both Hangouts and Hangouts with Extras provide group chat and group video chat and that is where the similarity ends. It is not clear yet whether the additional features of Hangouts with Extras will be merged into Hangouts or whether they will remain distinct. Screen Sharing – This allows you to share what is on your screen with others in your Google Plus Hangout. You may want to explain something on a website, show a diagram or share an image and screen share will let you do that. 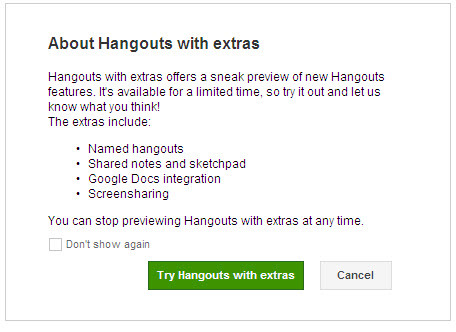 Once you are in Extras, click on ‘Start Hangout’ and the ‘Share Screen’ icon will appear at the top. When you click this button, you will be given a choice of screens from your computer to share with others (highlight the one you want to display and then click ‘Share Selected Window’). 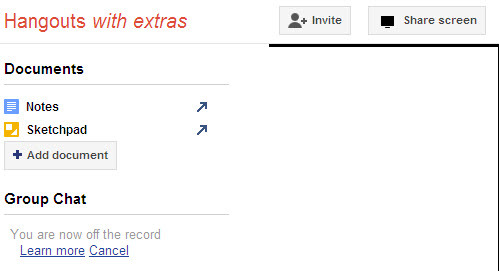 Google Docs Integration – There is a ‘Documents’ menu on the left hand side of the Extras screen. To add a document, you click “Add Document’. Default documents are also provided in the form of ‘Notes’ and ‘Sketchpad’. Google Plus Hangouts with Extras offers the opportunity to be creative with your small business marketing and staff communications and demonstrates Google’s ongoing commitment to the advancement of Google+.